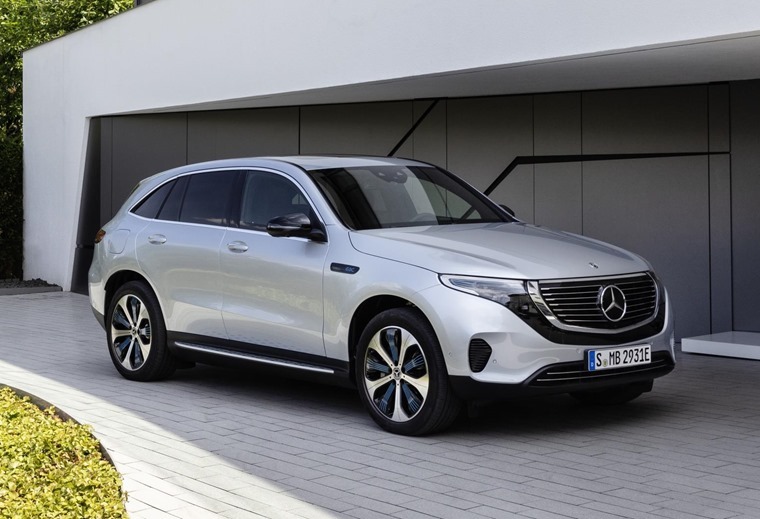 The Mercedes-Benz EQC – the brand’s first all-electric car – has been revealed ahead of its public debut at the Paris Motor Show. Here’s what you need to know. When it arrives in late 2019, it’ll be a rival for the other host of other premium electric SUVs such as the Jaguar I-Pace, Audi e-tron and Tesla Model X. On the outside, it takes the form of a high-riding SUV although it’s a little smaller and more conventional looking than both the Jaguar and Tesla. It takes its styling cues from the original Generation EQ concept that was revealed back in 2016. 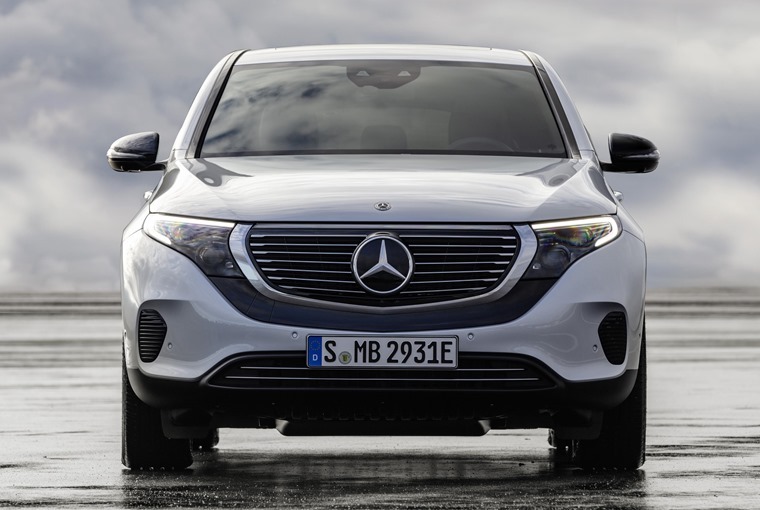 Up front, it gets a conventional grille – something that’s missing on many EVs. Angular, swept-back headlights are joined by a black panel that runs beneath the grille designed to be a “striking front feature”. It features optical fibres that are designed to be a visual link to the daytime running lamps. At night this creates an almost uninterrupted, horizontal light band. While it utilises the same 2,873 wheelbase as the current GLC, it’s longer (4,761mm) and more than 300mm lower than its sibling. 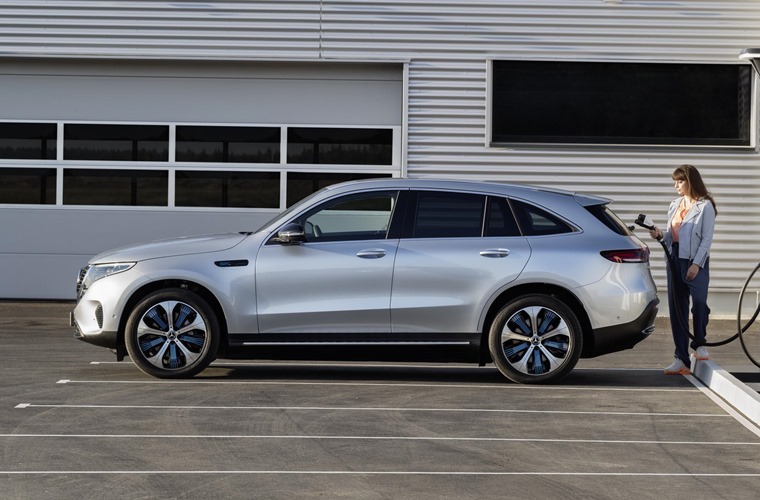 Its waistline is lower too; something Mercedes says makes it a cross between an SUV and SUV-coupe at the rear. 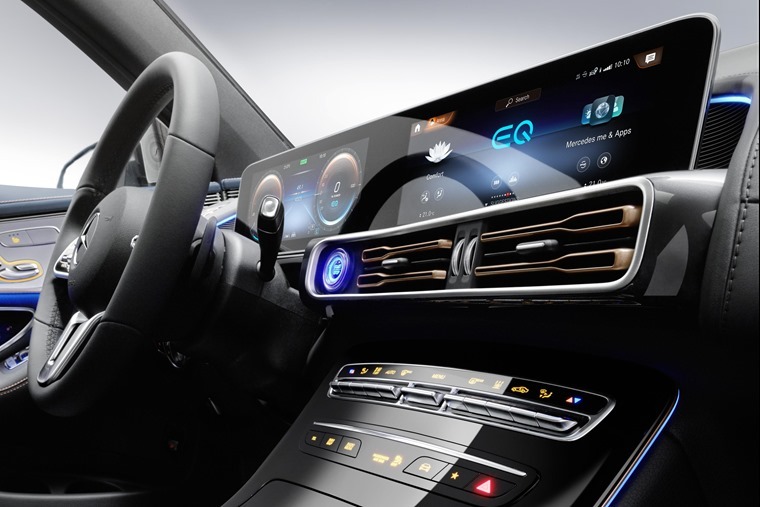 Inside, the stand-out feature is Mercedes’ latest MBUX infotainment and driver information system which, like the latest A-Class, is made up of a large display in a panel that runs across the dashboard. The system offers voice recognition and smartphone connectivity via the ‘Mercedes me’ application, as well as an eco-focused satnav that can calculate the fastest routes including charging times if necessary. The EQC gets five seats, and boot space stands at 500 litres – an impressive 79 litres more than the current GLC, although not as impressive as the I-Pace’s 559-litre cargo space. 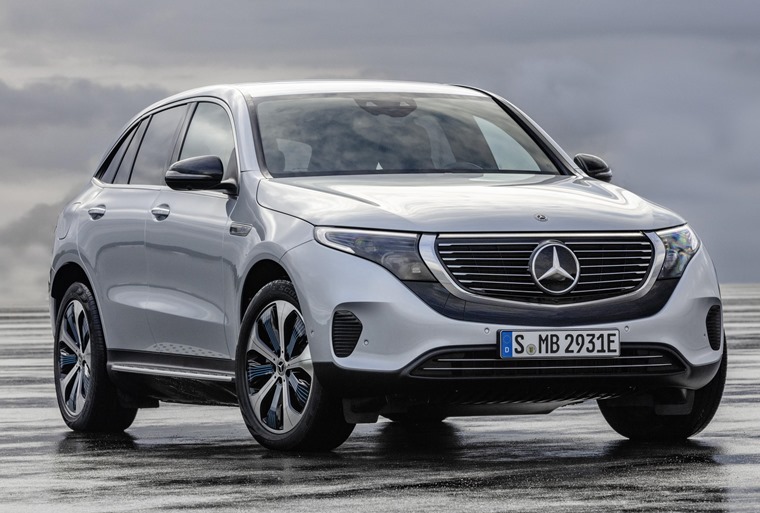 The EQC will be the first Mercedes to be powered by its next-gen electric drivetrain, that’ll eventually feature across its range of EQ models. Two electric motors power the front and rear axles, which gives the added bonus of four-wheel drive capability. Together they produce 402bhp and 765Nm of torque, meaning a 0-62mph run of 5.1 seconds. Top speed is limited to 112mph. The driver will get a choice of five driving modes: Comfort, Eco, Max Range, Sport and ‘Individual’. The latter can be configured by the driver to meet their particular driving style and allows them to adjust the regenerative braking system via paddles behind the wheel. 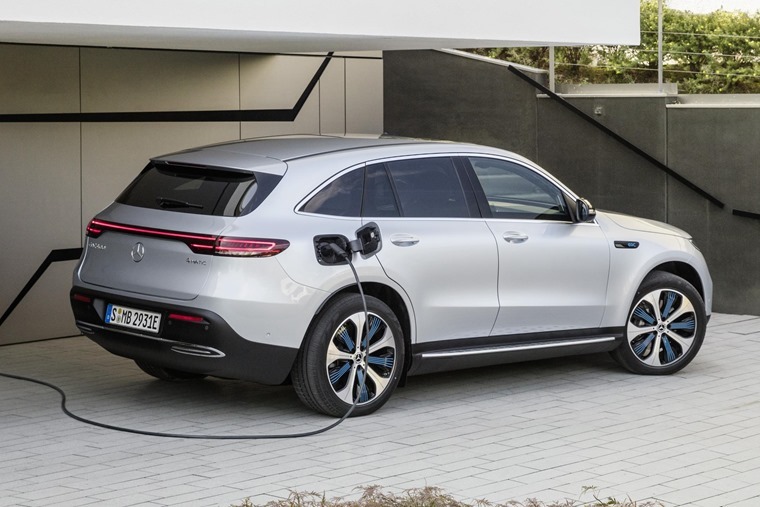 Its 80kWh battery pack will be capable of around 280 miles on a single change, with Mercedes claiming recharging from 10% to 80% capacity will take approximately 40 minutes. We’ll learn more about the EQC model range in the coming months, potentially at the Paris Motor Show. List prices and lease rates are to be revealed, but you can expect the first EQCs to arrive in the UK towards the end of 2019.